Senior White House adviser addresses US peace plan in Warsaw, reportedly noting plan will be presented after Israeli elections. Senior White House adviser Jared Kushner said that the US Middle East peace plan would be presented after Israeli elections in April. 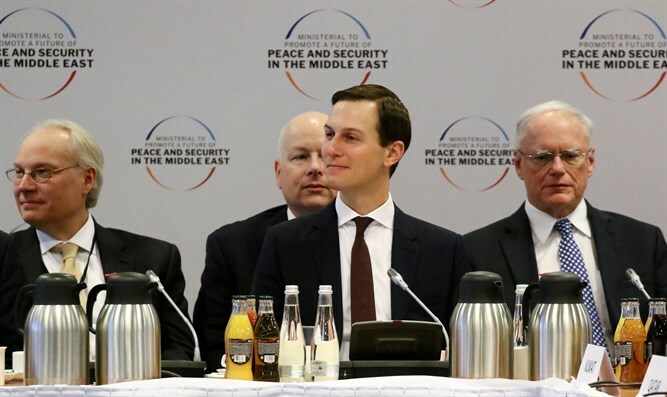 Speaking during a session at the US-Polish conference on the Middle East held in Warsaw Thursday, Kushner refrained from going into detail about the plan, but said that both sides would have to “make compromises,” according to reports. "I think hearing from Saudi Arabia, Jordan, and Israel probably did a better job than I could have done of explaining to you why this is very possible today and why there's reason to be optimistic. "If you look at the unifying principle of a lot of the Arab world over the previous time I think hatred of Israel has been the unifying principle. Now you're seeing in a lot of these Arab countries it's the love of their citizens and their desire to what in their countries best interests to provide them with the most opportunity and to prevent the most harm, and I think that's leading a lot of these countries to make different decisions and choose different paths. "We spoke about the Arab peace initiative. That's something I hear about a lot; I think it was a great initiative, in 2002 when it was done, but it hasn't produced peace, so if that was the framework under which something would be accomplished then I think that would have been accomplished a long time ago, and then I wouldn't be doing the duty I'm doing right now to try to bring the people together. "I would just urge everybody as this unfolds over the next months to keep an open mind... We'll hopefully find creative solutions where both sides can gain a lot more than they give, and we'll work alongside some traditional frameworks to try to find a way where people can be better off."